A little background about me may be useful in understanding where I'm coming from in this post: for basically all of college I was, frankly, really poor. I was always able to at least buy cheap food and drive to Bloomington to see Emilie, but sometimes not too much more than that. When I lived in an off-campus apartment during my senior year, this tightness of money motivated some sort of extreme behavior, including my roommate unscrewing several of his vanity lights and the apartment reaching pretty uncomfortable temperatures before any heating or air conditioning was turned on. I was unhappy living with such present reminders of my own lack of funds, so after graduation I reacted to my new full-time job and nice apartment by doing basically the opposite: making my apartment as comfortable as possible, and just budgeting a higher amount of money for utilities. After all, it would be sort of silly to be shivering in my own apartment when I can easily afford to heat the place. After about seven months of this style of living, I noticed that my utilities budget has been bumped up several times and has nearly grown to the size of my grocery budget. Since I can afford to pay for my utilities, and since I value my comfort at least as much as the money high utilities would cost me, any energy saving ideas I implement are not allowed to make my life any less comfortable. It seems selfish, and it is, but it also seems pretty fair. I value my comfort as least as high as my current utility bills, so it doesn't make sense to sacrifice it to make them lower. So with that background, let me explain what I've done to try to save some clams behind the scenes. My first purchase, which was really the one that kick-started my interest in cutting these energy costs, was a Nest Thermostat. It was a total impulse buy at Lowe's, but I'm really glad I did it. It is still just a thermostat, but it does bring some pretty sweet features to the table, some of which are aimed at saving money. 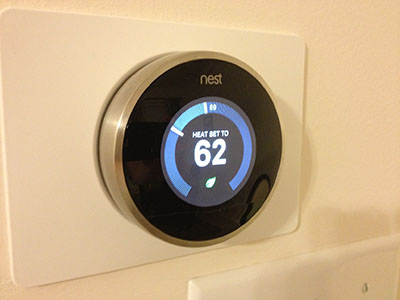 To start with, Nest connects itself to your home wifi, allowing you to control your thermostat through the Nest.com web app, or through the Nest iOS or Android apps. Being able to control the thermostat remotely may be one of the biggest cost savers, at least to someone like me, because I'm happy to turn down the heat in my apartment when I'm gone; I just don't want to have to sit in a cold apartment for an hour while it warms back up. The other big advantages Nest has are its easy-to-design schedule and its Auto-Away mode. Between the two of these, it's very difficult for me to actually leave the heat on when I'm out of my apartment for any significant length of time. I'm very hopeful that this gadget will save me some money, though it's yet to be determined how long it will take to pay for itself. As I considered how much money my new thermostat would save me, it occurred to that there may be other optimizable things about my apartment, namely the lights. I had always thought (and still do) that living in near darkness was sort of silly for the small amount of money it saves, but I hadn't considered what sort of difference it would make to make my existing lights more efficient, regardless of their usage. A quick count around my apartment gives me 26 60-watt light bulbs that are almost always turned on, 3 more that are rarely turned on, and 2 in the laundry room that are almost never turned on. Twenty-six lights seems like a ton, but when each light fixture hold multiple bulbs and your apartment has lots of nooks and crevices, having the main areas lit means having lots of lights on. Anyway, if we just look at the 26 bulbs that are on when I'm home in the evening (from about 5:30 to about 10:30, 5 hours), those bulbs use around 7.8 kWh per day, at $0.108662 per kWh (I know, Boone REMC is expensive), my regular lights cost me something like $0.85 per day, and that's just on weekdays when I'm only home in the evening. Now, let's consider replacing each 60-watt bulb with its 13-watt CFL equivalent. 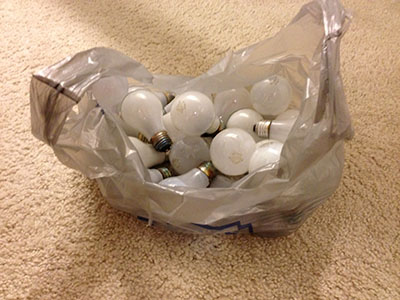 Using the same math, such a replacement set of bulbs would only cost me about $0.18 per weekday, a $0.67 savings. That doesn't seem like much, but over the 22 or so weekdays per month, that's $14.70 in monthly savings, not even considering weekends. As the above math shows, it seemed totally worth it to spend some money replacing the lights in my apartment. After a little research (and admittedly buying the wrong ones), I realized that it's really important to buy the Soft White CFL bulbs. Otherwise they look blue and your home looks like a hospital. With this new knowledge, I ended up buying these lights from Lowe's, though I also had to buy a smaller half-pack to go with it, as well as few with smaller bases for my ceiling fans. All in all, I spent about $50 replacing the light bulbs in my apartment. I can hardly tell the difference in how my lighting looks (if anything, it's brighter in here), so I'm very excited to see what kind of money this ends up saving me. The final change I made is technically breaking the rules I set for myself, but I'm really okay with it. For a long time, I've just taken as long of a shower as I wanted, turning the water off basically when I got too bored or too hot. It's a great time to think, and I valued that along with the comfort of the hot water. My shower head is marked as a 2.5 GPM (gallons per minute), so if we consider reducing a 30-minute shower to a 10-minute shower, once per day, that could possibly reduce my water usage by up to 1500 gallons (I use something like 2500 gallons most months). Now in practice, I'm sure it won't be quite that much, especially if the shower head isn't outputting its full volume every minute, but the numbers above are at least interesting enough to warrant giving it a try. So, for the last couple of weeks I've been trying to keep my showers to around 10 minutes, which is actually harder than I thought since I so naturally slide into a daydreaming mindset while I'm in there. I'm very interested to see what a difference making a conscious effort has. If it does significantly reduce my water costs (which are pretty high since my water and sewer are provided my the neighboring town of Whitestown, not Zionsville), I'm sure it will motivate me to be even stricter about my shower times. The main reason I'm okay with this change even though it does introduce some discomfort is because I now really value the extra time taking a short shower allows me in the morning. This makes it less an issue of being afraid to take showers and more an issue of good time management with a side-effect of saving money. I do somewhat regret how unscientific I've been about implementing these new practices and hardware, because my doing them all at once will pretty much make it impossible to tell which ones work and which ones don't, because all of the changes in power usage will happen in the same month. My water bill should be easier to interpret, so at least I'll be able to report on just how useful shower shortening is. The other bummer here is that I won't be able to report any results for at least a few weeks. Even then, my bills may be a little inconclusive since I made these changes about a third of the way into each billing cycle. Hopefully, if nothing else, I'll be able to report whether or not it's working in a few weeks, even if I can't very well quantify just how well it's working. If anyone is curious about any of the things I've talked about here, just let me know. I plan on writing a more substantial review of the Nest by itself after I've had it for a little longer, so stay tuned for that if you're interested but hesitant to spend the money.